U.S. 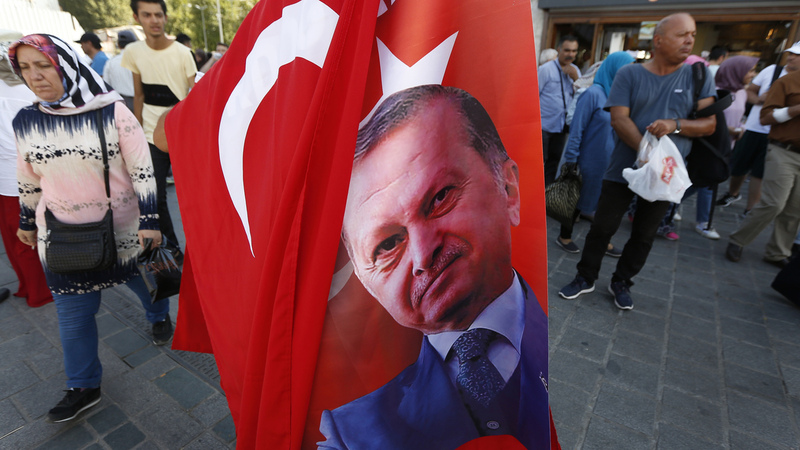 Threatens Further Sanctions Against Turkey Over Detained Pastor Rising tensions between the two countries have caused Turkey's currency, the lira, to plunge by about a third of its value against the U.S. dollar since January, sparking fears of an economic crisis. The U.S. says it may impose more sanctions against Turkey, as the diplomatic rift between the two countries deepens. The lira has lost about a third of its value against the dollar since January. The U.S. is threatening further sanctions against Turkey if it does not quickly release American pastor Andrew Brunson, who has been detained by the Turkish government for nearly two years. The diplomatic spat is also taking a toll on Turkey's currency, the lira. Turkey says Brunson has ties to political groups responsible for the 2016 attempted coup of President Recep Tayyip Erdogan. Brunson runs an evangelical church in the Turkish city of Izmir. The U.S. says the pastor is "a victim of unfair and unjust detention." Turkey has accused Brunson of espionage and having ties to the Kurdistan Workers Party and the movement led by cleric Fethullah Gulen. Brunson has denied those charges. If found guilty, he faces up to 35 years in prison. Earlier on Thursday, Treasury Secretary Steve Mnuchin hinted at more sanctions over Brunson, saying, "We have more that we are planning to do if they don't release him quickly." The U.S. doubled its tariffs on metal imports from Turkey earlier this month. In retaliation, a Turkish court refused to release Brunson, and the Turkish government raised its tariffs on imports of American cars, alcohol and tobacco. Turkey has repeatedly criticized the U.S. for not condemning the coup attempt two years ago. Erdogan wrote in an op-ed last week for The New York Times: "The Turkish people expected the United States to unequivocally condemn the attack and express solidarity with Turkey's elected leadership. It did not. The United States reaction was far from satisfactory." The Turkish government has also complained about what it calls U.S. support for Kurdish rebel groups fighting in northern Syria, and it has condemned the U.S. refusal to extradite the Pennsylvania-based Islamic cleric Fethullah Gulen, who Turkey has accused of masterminding the 2016 coup attempt. "My government has repeatedly shared our concerns with American officials about their decision to train and equip the P.K.K. 's allies in Syria. Unfortunately, our words have fallen on deaf ears, and American weapons ended up being used to target civilians and members of our security forces in Syria, Iraq and Turkey." The rising tensions have caused the value of the lira to plunge by about a third of its value against the dollar since January. The currency's fall has also sparked fears of an economic crisis in Turkey that could spread globally. With his relationship with the U.S. on the rocks, Erdogan has worked to strengthen his alliances in Europe and the Middle East. Last week, Erdogan wrote, "Washington must give up the misguided notion that our relationship can be asymmetrical and come to terms with the fact that Turkey has alternatives." Erdogan has recently held talks with French President Emmanuel Macron and German Chancellor Angela Merkel. And on Sept. 28, Germany will host Erdogan for a state visit. His efforts have also found some success in the Middle East. This week, Qatar pledged $15 billion in support to Turkey. As The New York Times reports, "The sum is a small fraction of what Turkey would need to shore up its faltering economy or pay its dollar debts, which have become increasing unsustainable after a sharp decline in the Turkish lira."